A Check Engine Light can be a very scary thing and it always comes at the wrong time. Let us make an inconvenience, convenient. There are plenty of automotive shops and parts stores that offer the free check engine light diagnostics, but be weary of this service. You just might end up replacing parts that aren’t even necessary for your vehicle,costing you much more in the long run. At Skeeter’s Auto Service, we use only the finest in diagnostic equipment and technology, making us your one-stop automotive repair shop. Cutting-Edge diagnostic technology, full access to GM’s Global Diagnostic System, complete GM Vehicle calibrations/reprogramming, TSB’s, recall’s, wire schematics, and Tech Support. This is the same tool used by GM dealerships with the same level of functionality. Provides complete diagnostic coverage of current and future Ford and Lincoln vehicles. This includes module reprogramming, key programming, and other functions. This is the same tool used by Ford and Lincoln dealerships with the same level of functionality. PC-Based diagnostic system for Dodge, Chrysler, Jeep and North American Fiat vehicles. wiTech utilizes a Vehicle Communication interface (VCI) to connect the vehicle to the PC and through the specially configured internet access point to perform diagnostics, reprogramming and security functions. This is the same tool used by Chrysler dealerships with the same level of functionality. The service support source for all Toyota produced vehicle marketed in North America. TIS includes all of the vital information needed to effectively service Toyota Products. This is the same tool used by Toyota dealerships with the same level of functionality. 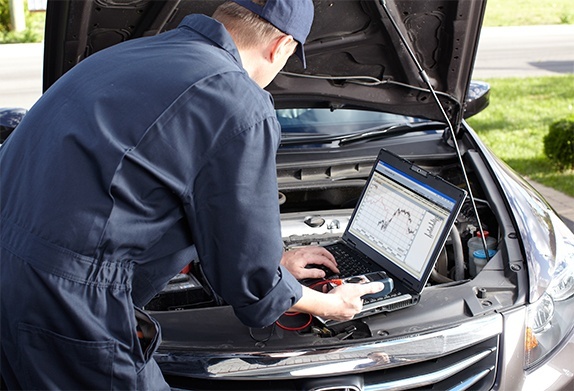 Our ASE Certified Technicians will use our top-of-the-line diagnostic tools to give you an in-depth reading and analysis on your vehicle. This analysis is accompanied by a thorough inspection to find the root of your problem, the first time. Finding the root of the problem right away could prevent multiple costly trips back to the shop. We pride ourselves with always being up-to-date with the industry’s finest repair technology. That’s why you’ll only find factory-grade diagnostic equipment in our facility. Rely on Skeeter’s Auto Service and our experienced technicians to get it right the first time! Don’t let your check engine light worry you; visit Skeeter’s Auto Service for peace of mind. After we’ve determined what is ailing your vehicle, our technicians and service advisors will work together to ensure you are informed of every issue, upfront. Before completing any repairs, we will provide you with a guaranteed cost estimate so that you may make the ultimate, informed decision. At Skeeter’s Auto Service, we always stand behind our repairs with our 3 Year/36,000 Mile warranty. Call or stop by today for diagnostics or any repair! We’d love to have you. We always provide a comfortable waiting area and a courtesy shuttle to bring you to and from home or work! Trust the Skeeter’s Auto Service family for all of your automotive needs.